Using jigs to concentrate coal and minerals has been around for a long time, the use of jigs for concentrating ores was reported in De Re Metallic by Agricola published in 1556. And he referenced earlier work going back to Egypt almost 3000 years ago. Early ore jigs used a basket, loaded with ore, that was moved up and down (jigged) in a tank of water. This jigging allowed the particles to become rearranged in layers of increasing density from bottom to top. The same principle is used in modern jigs to stratify and separate the particles of differing density. For more information on how jigs work see SDM an Introduction to the Principles of Jigging. Jig circuits can be one of the simplest mineral processing circuits, primarily as jigs are rather forgiving in operation. Jigs come in different sizes and shapes, but in general, a jig plant is essentially a materials handling system that is designed to supply ore in a specified physical state to the jigs and to carry away the products. The most basis example is a placer jig circuit (Figure 1). 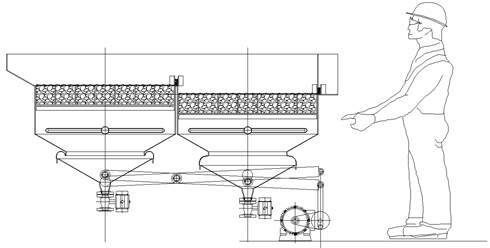 It consists of a feed hopper and conveyor (sometimes not included), a trommel to remove large oversize rocks, the jig, a water circuit, and a tails handling method. 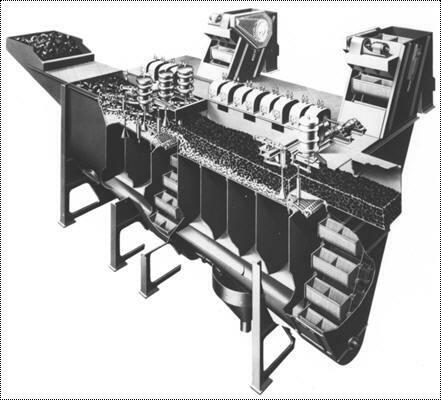 The other is a coal cleaning circuit (Figure 2) which consists of a Baum jig usually fed directly from plant feed, producing a final reject from the first compartments, a recycled middlings (usually crushed) from the second, and a clean coal. The clean coal is often screened for fines processing, due to inefficiency of the primary jig cleaning fines. Jigs use a large amount of water so reclamation of water with recycling is standard practice. Clean water is not necessary as clay and fully suspended slimes do not appreciably affect results up to an apparent density of 1.05. However, provision must be made to clarify enough water to stay below this level. In some cases chemical additions may help. The fundamental principles jigging are essentially the same for all jigs, the basic differences between the various types of jigs are a matter of practical engineering to optimize the operating performance, materials handling, maintenance and control. The earliest jig was a moving bed jig (see De Re Metallic by Agricola). The screen containing the bed is jigged up and down in water to create the liquid pulse. There are some significant advantages to moving bed jigs both in performance and water consumption. But since they are not commonly found, this discussion will be returned to in another paper. Currently, the majority of jigs found are of the fixed bed type in which the liquid pulse passes up and down through the jig bed which is retained on a stationary screen. The different types of fixed bed jigs are given shown in Figure 4. For coal cleaning, the Baum (Figure 5) and Batac jigs are the most common type. For other minerals, the Pan-American (mechanical or diaphragm) jig is the most commonly used type. 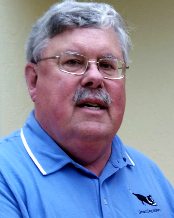 This dif­ference has more to do with through put capacity, especially float capacity. 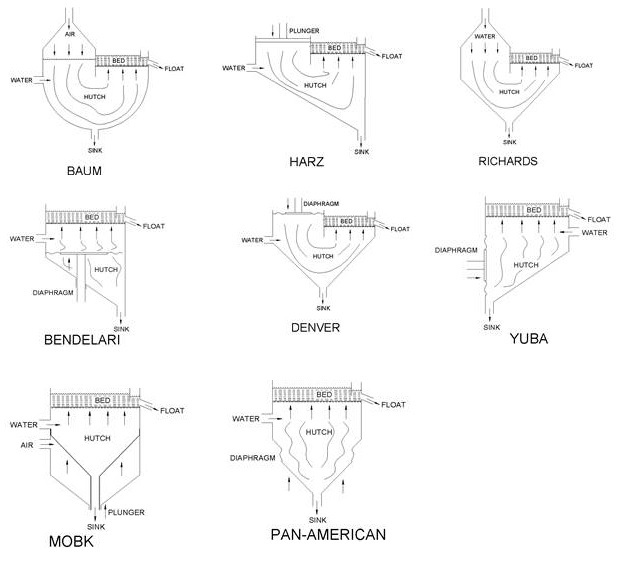 Baum and Batac jigs of 1500 tons/hour capacity exist. A small Baum jig would have a capacity of 50 tons/hour. A jig of 100 tons/hour capacity is large for a mineral jig. Large mineral jigs, and small Baum jigs can be found. But the above pertains to most common capacities. Batac jigs are Baum style jigs, with the air chest under the deck screen (usually on the divider wall between cells). Other than this they are similar in operation and capacity to Baum style with improved performance reported for fine sizes. Having the air chests under the screen requires less floor space. They also tend to have improved instrumentation giving better control. Sizing is similar to a Baum jig. Baum style jigs usually have two compartments, a primary and a secondary (figure 5). Coal is normally fed to the primary where the main reject is produced. Coal from the primary feeds the secondary which produces the clean coal. 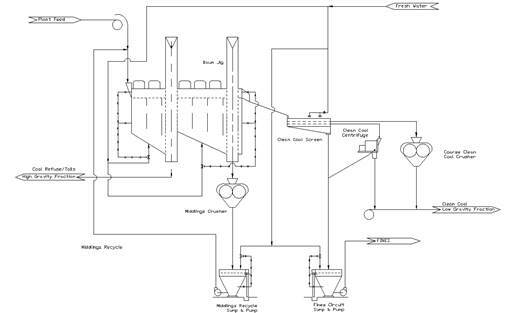 The secondary reject may be a second or middlings product (market depending), recleaned in another jig, combined with the primary reject, or recycled (partly) to the feed. A few three compartment Baum jigs have been used, adding a tertiary stage. This would be used for a coal having a large amount of near gravity material. The most common mineral jig in use today is the Pan-American style, although some Yuba and Denver jigs can be found. Circular jigs tend to fall into two groupings, single hutch round jigs and ones made of individual cells like segments in an orange. In both cases improved performance is gained by allowing the bed to spread, allowing finer particles to separate better. But at a space penalty and in more complicated feed and concentrate systems. General sizing is similar to other mineral jigs. The typical Pan-American (often just Pan-Am) jig as shown in Figure 6, is normally built as a duplex jig (a pair of balanced jig cells). Each cell is consists of an upper hutch (usually rectangular), a lower hutch (usually conical), joined by an annular diaphragm of flexible rubber to allow up-and down movement of the lower hutch. stroke frequency – 120 to 200 cycles per minute. Pan-Am duplex jigs are popular in many regions, and can be seen in action in Alaska, Yukon, South America, and Africa, much of this is due to their inherent simplicity and relative ease of maintenance. Jigs are sized on the feed tonnage per unit of jig area. 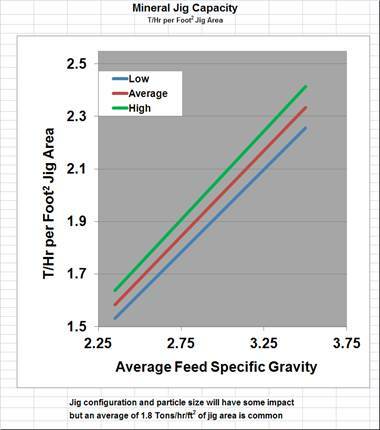 Different types of feed will require different sizing criteria. Specifically coal jigs have different sizing criteria than mineral jigs. 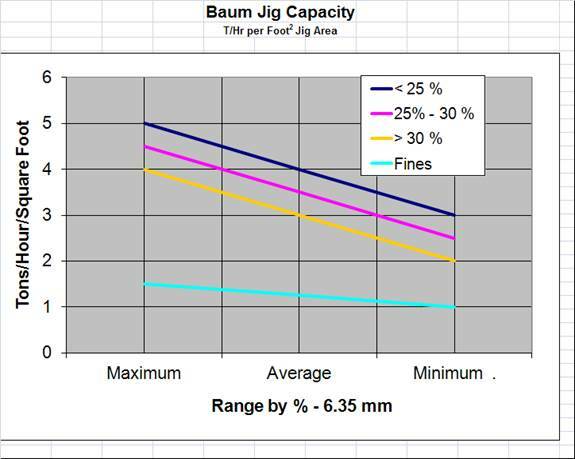 Coal Jigs (Baum & Batac) capacity depends on the amount of fine feed. The greater the amount of fines, the lower the basic jig capacity. If the amount of fines is above 30% by weight, the fines may size the jig. While a portion of the fines may be removed by classification ahead of the jig, some fines are needed. If a classified (screened) feed is used capacity will decrease or greater amounts of water will be needed. In this case fines being the material that is ¼ of the average particle size. Part of this is due to normally larger particle size being feed in coal. Feed sizes of over 6” top size are common. Since a large portion of the work in separation is done processing marterial near the gravity of separation, for coal feeds that have a high amounts of material near the gravity of separation, the jigs capacity maybe limited by its refuse handling capacity. For coal jigs, normal water use is 7 to 8 gal/min of water per ton/hour of dry solids. This water is split 30% to the feed, and the remainder to cells. A more precise way of cal­culating water requirements is in gal/min per square foot of jig area allowing for the dilution of the fines. Fine particles are needed to create a semi- suspensoid (heavy medium). Typical coal jig capacities are shown in Table 1 and Figure 7. 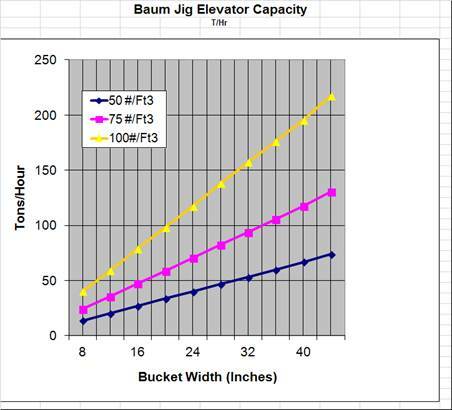 Baum and some Batac jigs use bucket elevators to drain and discharge the refuse. The physical ability to ex­tract the refuse may be the sizing criteria. A check is also made of the sink (refuse) handling capacity (figure 8). Normal water use is 7 to 8 gal/min of water per ton/hour of dry solids. This water is split 30% to the feed, and the remainder to cells. A more precise way of cal­culating water requirements is in gal/min per square foot of jig area allowing for the dilution of the fines. Fine coal particles (minus 6.35 mm (1/4")) are needed to create a semi- suspensoid (heavy medium). Table 2 gives general requirements for Baum jigs. · Stroke Speed and length. Balancing the stroke speed and length are two important aspects, and can lead to good or poor performance. Jigs have a natural period of motion which results in an optimum speed for any given type and size of jig. The Material characteristics also impact this. · Water Flow. The jig stroke is modulated by the water upflow. Too much hutch water can cause losing fine values to the tails. Too little hutch water can can cause the reporting of tails to the concentrate. · Ragging. Determining the proper type and size of ragging is important in the final specific gravity cut point. The tails will in general be lighter than the ragging, while the concentrate will be heavier. Ragging size also limits the size of the coarse material that will pass. · Jig Slope. The bed must be sloped across large jig machines to provide bed movement. Jig design must allow for adjustment of this slope in the installation. · Jig area. The area of the jig is what determines the feed capacity. The following is an example of sizing and selecting a coal (Baum style) jig. It is included for reference only. In actual practice many different factors can cause the specific selection to change. 85% (at 1.65 Sp.Gr.) reporting to clean coal. From above, a 734 jig (7 foot wide, 7 cells) has a jig area of 147 Ft2. Of this, normally 75 to 80 % reports to the primary elevator, or design for 60 T/hr in the primary. From figure 8, this would require a 22 inch wide elevator as a min­imum. For a feed rate of 500 T/hr the average water requirement would be 3500 to 4000 g/min. As the amount of minus 1/4" material is low, using 3400 G/min is probably adequate as a starting point. Of this, 30 % (1020 G/min) would be added to the feed and the remainder to the cells (340 g/min each). In general a mineral jig is sized in a similar manner.